Fall is a wonderful time to witness the infinite variety and depth in this life: each tree variety’s leaves turn to their natural, non-chlorophyll-spiked color, and drop at a different time. 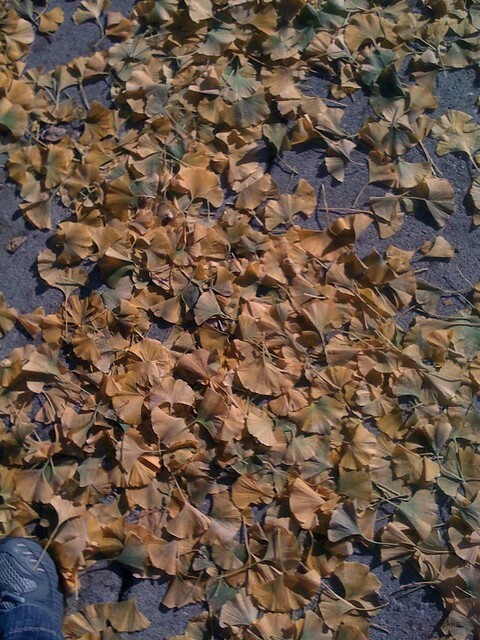 The gingkos appear to pick one day, usually a rather crisply cool one, to drop all of their leaves. This was one of my first delighted discoveries, as a new homeowner, six years ago – and my property doesn’t even have a gingko. In my yard is just one massive Norway maple, which drops its 15+ bags of golden yellow leaves, spread out over a few weeks, well into November. Suddenly, as someone newly endowed with a yard of her own, I started looking at trees. And gardens. Before this, I’d never even thought I’d enjoy gardening. In a recent yoga class, the teacher reminded us that every pose has a drishti: in order to enable better focus in the asana (pose), the eyes need to settle on one unmoving spot, be it the tip of your nose, or your toes, for example. The eyes need to stay lasered-in on at that item; to not wander around the room, in order to help the yogi sustain the pose with strength and grace and to gain more benefits from the pose. Up until that point, in my practice and my own teaching, the term drishti mainly came up during difficult balancing poses like eagle or dancer (i.e., “find a point to focus on in front of you, a drishti, to help you stay steady…”). I understood, or at least, had read, that the tool was valuable in more of the practice, but hadn’t had my own experience to prove it. Just using it in 2-3 standing balance poses in a class wasn’t a useful exercise, though many of my cues in other poses do indicate where the gaze needs to be. Perhaps that was the problem-“gaze,” to me, feels like an action that is not very full of intent (it’s awfully similar to “haze”). Also, for several poses, a gaze cue is given in order to keep the spine in a safe or empowered alignment, such as in bridge or cobra. In my practice since that class, I’ve taken extra care to keep my gaze steady, somewhere, while holding a pose. Free from the distractions of the patterns in the wooden floor, the stylish pants of the yogini next to me, or my need to visually confirm that my knee is safely aligned over my ankle, my mind has been more free to focus on my breath. One of the more obvious benefits that afforded me: I was able stay a little longer in chair and horse poses, at today’s class. It’s possible that it also afforded me a deeper relaxation, at the end of the class. But later on, in the day, that small bit of focus practice helped me work out some conflict, with a coworker. Keeping my mind focused on one thing at a time helps me to understand situations, and to figure out how to resolve conflict. We can all benefit from a little less multi-tasking, these days.